Guoping Feng, PhD is the Poitras Professor of Neuroscience at the McGovern Institute for Brain Research, Department of Brain Cognitive Sciences at Massachusetts Institute of Technology. He also serves as the Director of Model Systems and Neurobiology at the Stanley Center for Psychiatric Research at Broad Institute of MIT and Harvard. 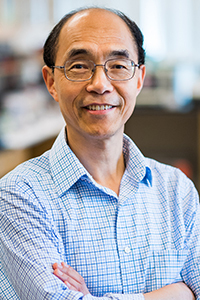 Dr. Feng’s research is devoted to understand how neurons communicate with one another and how defects in neuronal communications contribute to neurodevelopmental and psychiatric disorders. Using genetically engineered animal models, Dr. Feng’s laboratory combines cutting-edge technology and multidisciplinary approaches, including molecular genetics, electrophysiology, imaging and behavioral analysis, to unravel the pathological mechanisms of brain disorders. Dr. Feng’s research on OCD and autism has significantly advanced our understanding of these debilitating brain disorders and provided potential new directions for developing effective treatment.